Easily grown as a houseplant in St. Louis because, among other things, it tolerates a wide range of temperatures, does not require a humid atmosphere, may be grown in low light, will tolerate less than regular watering and is easily maintained. Best grown with a well-drained, peaty potting mixture. Best sited in bright indirect light, but tolerates full shade. Avoid direct sun. Water regularly from spring to fall, but reduce watering in winter as plant rests. Regular temperatures in summer and minimum 50F in winter. 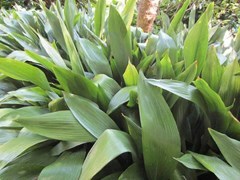 Aspidistra elatior, commonly called cast iron plant for its ability to survive significant cultural abuse, is native to China and Japan. It is an easily-maintained, stemless, evergreen foliage plant that typically grows to 3’ tall. Arching, lanceolate, glossy dark green leaves (to 24” long and 4” wide) rise up directly from its fleshy rootstock on long stems. Insignificant creamy-purple flowers may appear at soil level in spring, but usually do not form on houseplants. Leaves benefit from occasional washing. Genus name comes from the Greek word aspidion meaning a shield. ‘Variegata’ has green leaves variegated with white striping. Rugged houseplant for shady areas of the home.